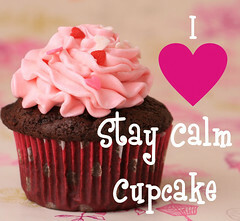 holiday baking | Stay Calm, Have A Cupcake! 25 days til Valentine's Day ! Can you believe it is already the end of January?!? I do not enjoy how fast time is flying. Seems the older I get, the more I find myself questioning where the heck the time went!! It doesn’t help that many stores had Valentine’s decorations and candy on sale before Christmas was even over. I LOVE Valentine’s day – but they started pushing it a little early this year! Speaking of , there are officially 25 days left until Valentine’s Day. Which means we all still have a decent amount of time to think about what we are going to get that special someone on the day that celebrates love! 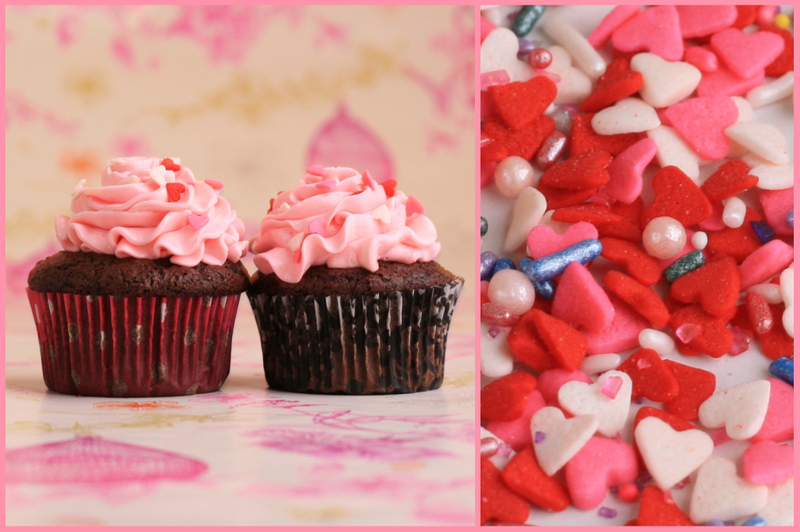 It also means that for the next 25 days, I have an awesome excuse to bake, decorate, and eat tons of girly pink cupcakes! Today I want to share some Valentine Inspiration with you. Hopefully this will help you start thinking about the many SWEET ways we can celebrate Valeninte’s Day – starting with fresh Strawberry Frosting! This yummy strawberry frosting is perfect for any chocolate, vanilla, or lemon cupcake. It is fresh, elegant, and taste amazing! 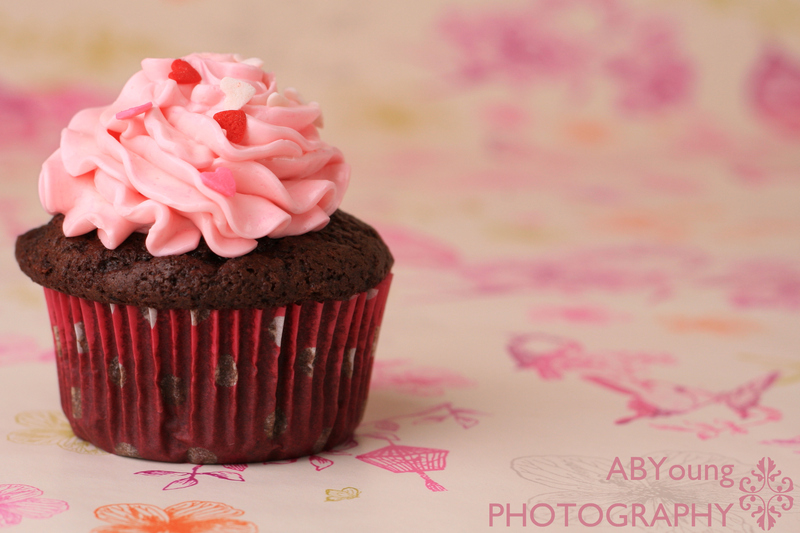 The pink color and the fresh strawberries make it the perfect Valentine’s treat. This frosting is different from my Strawberry Buttercream, but just as easy and just as yummy! • Slowly add in the powdered sugar one cup at a time, making sure it is fully combined before adding the next one. • Heat on medium heat until mixture comes to a boil. • Add the cooled strawberry compote to the mixer and combine with the frosting (make sure your strawberries are completely cooled or you will ruin your frosting) Mix for 2 minutes. There you have it, yummy strawberry frosting! I like this frosting best on top of a chocolate cupcake- it’s a fun take on chocolate covered strawberries 🙂 After all, who doesn’t love strawberries and chocolate! 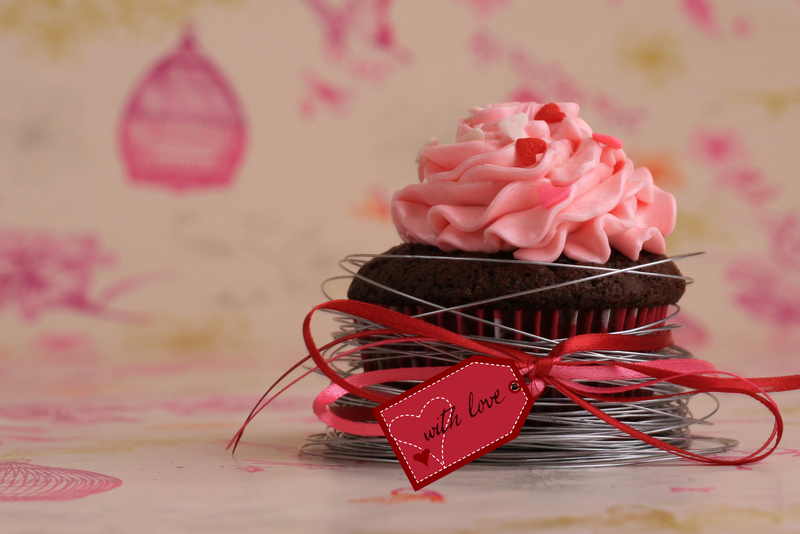 Enjoy the recipe and keep an eye out for a Valentine’s Giveaway – coming soon!!! Today in Florida the weather is refreshingly chilly, a bit windy, and so very seasonal!! I was admittedly not in any sort of holiday spirit a week ago, but am coming around. I finally feel like being festive! 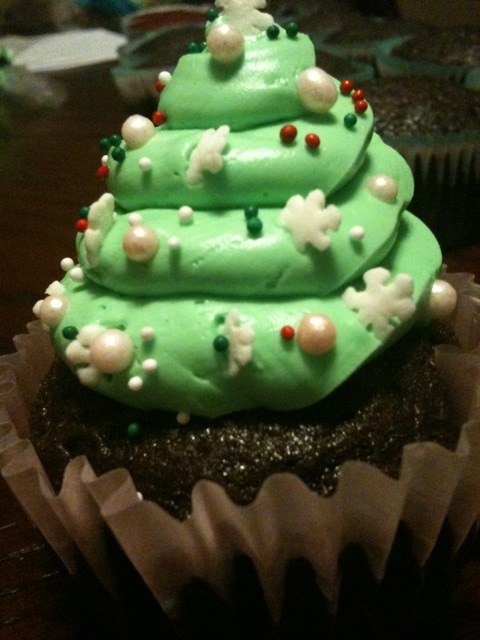 Today’s recipe is for Christmas Tree Cupcakes. These cupcake are so easy, and are a great project to do with the kids or even a group of your girlfriends. The decorating options are endless and people won’t believe how delicious these little trees taste! For starters, you will need to decide on a base flavor for your cupcake. I chose chocolate because I knew I wanted to top it with my mint buttercream. But if you don’t like mint chocolate you can make regular buttercream frosting and tint it green. Here is the buttercream recipe I use (and love!! )It is a wonderful base recipe that can be adapted to almost any flavor you desire!! To decorate fill a piping bag with your frosting and cut the tip off. Make sure you have a large enough hole for the frosting to come out of. Pipe the frosting onto your cupcake starting from the bottom and swirling your way to the peak of the tree. Practice a few times if you aren’t comfortable with it. Gather your Christmas sprinkles and start decorating! I used little candy pearls and placed them on first. I then used little snowflake sprinkles and placed them around each layer – topping the tree off with one as the star. You honestly cant go wrong here, any type of sprinkle you use will be absolutely adorable! 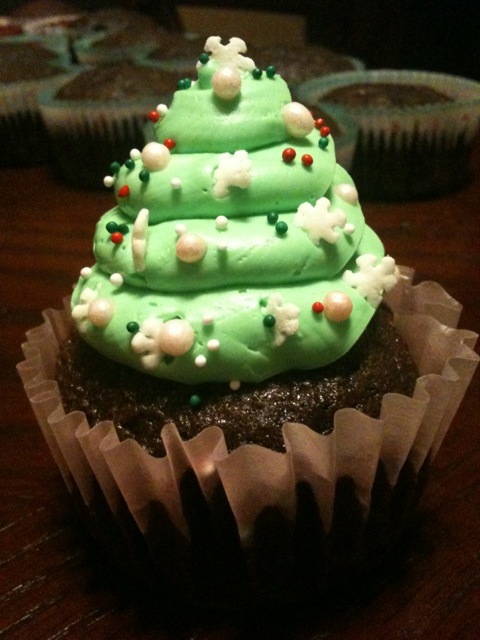 Voila – Christmas Tree Cupcakes! I took mine into the office and they were such a hit. People always love a festive treat! P.S. Don’t forget to order your cupcake goodies for the holidays. I have added a ton of new stuff to my shop. Visit me at www.etsy.com/shop/staycalmcupcake . Use code SCCS10for a 10% DISCOUNT! Can you believe that Thanksgiving is next week?!?! I can’t! I feel like just last month I was working on a summer inspired strawberry lemonade cupcake recipe . Boy how time flies! Today my post is another Holiday inspired recipe. It’s a yummy recipe to top your favorite chocolate, vanilla, or white cake cupcakes with. Peppermint Twist! Yum! Peppermint Twist butter-cream is a different type of mint then my Green Mint Frosting (Recipe Here ) Peppermint Twist tastes just like candy canes!! Set your mixer on medium speed, beat the butter until smooth and silky. Turn the speed to low and add the pudding mix, when it is all incorporated, slowly add the cream, a little at a time. When fully incorporated bring speed up to high and beat for 5-7 minutes. Turn speed back down to low and add peppermint extract and powdered sugar by Tbsp. Beat again at high speed for a good 5 minutes to ensure creaminess. 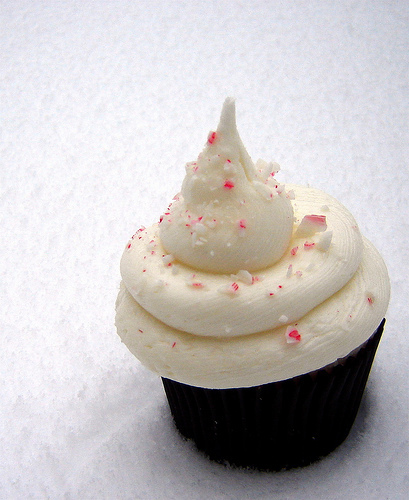 If you don’t want red stripes, crunch up some candy canes and sprinkle them on the top of your cupcake! 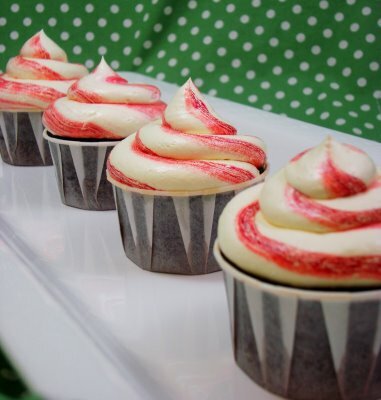 To get the red stripes in your frosting, draw three (3) red food coloring lines inside your piping bag. Put the frosting in the piping bag and begin to pipe onto your cupcakes. Voila…red and white frosting that is as delicious as it is beautiful!! Sugar and Spice and Oh So Nice!! Pumpkin Spice is a close second to Chocolate Mint when it comes to my favorite holiday flavors. I had some free time this weekend so I decided to experiment with a pumpkin spice cupcake/muffin recipe. I can’t lie – I ate 3 before I even frosted them! 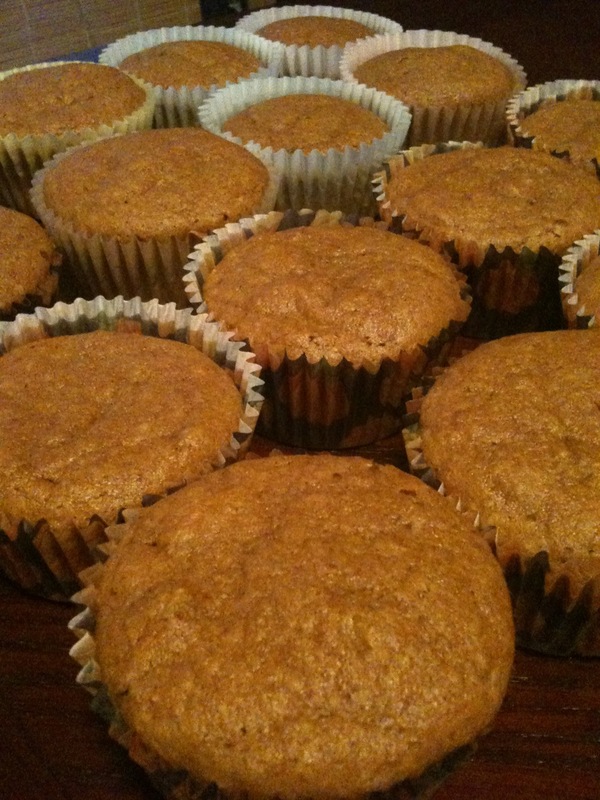 The great thing about Pumpkin is that anything you bake with it comes out so moist! That means, its perfect for cupcake making! 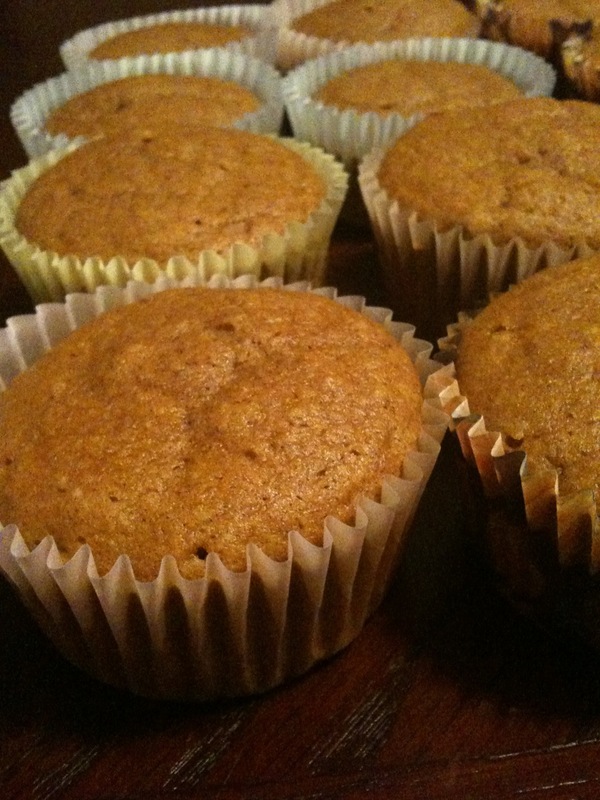 Below is the recipe I used for really yummy Pumpkin Spice Cupcakes. I don’t know what I loved more, the honey cinnamon icing or the moist cake! If you leave the icing off though, they are more like muffins, perfect for breakfast on the go. With or without frosting, these baby’s are YUMMY!! Cream the butter and cream cheese until light and fluffy. Takes about 2 minutes on Medium High. Add the honey and cinnamon, and gradually add the powdered sugar one cup at a time. Add the milk and more powdered sugar (if needed) until you get your desired consistency. In a large bowl, cream butter and sugar until light and fluffy. Add eggs, one at a time, beating well after each addition. 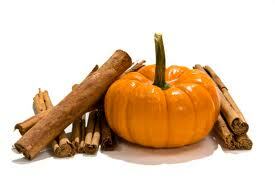 Add pumpkin and mix well. Combine the flour, pie spice, baking powder, cinnamon, salt, baking soda – Add to the creamed mixture alternately with buttermilk, beating well after each addition. Fill paper-lined muffin cups three-fourths full. Bake at 350° for 20-25 minutes or until a toothpick inserted in the center comes out clean. Unfortunately, I didn't get a photo with frosting on the cupcake. I forgot! !